A healthy 56-year-old Vietnamese woman presented in January 2009 with a 1-year history of left-sided hearing loss and tinnitus, intermittent dizziness, and hoarseness. Audiometry evaluation revealed bilateral low-frequency hearing loss that was more severe on the left. Office nasopharyngoscopy showed a slightly hypomobile left vocal cord. An MRI of the brain with contrast revealed a 2.2 × 1.8 × 6.0-cm heterogeneously enhancing left skull base mass in the transverse (TV), anteroposterior (AP), and cranial-caudal (CC) dimensions, respectively (Figure 1A). Somatostatin receptor scintigraphy confirmed increased radiotracer uptake in the skull base lesion. The patient was clinically diagnosed with a paraganglioma of the left skull base. The tumor was treated definitively using intensity-modulated radiation therapy (IMRT) to a total dose of 4500 cGy in 25 fractions using 6 MV photons prescribed to the 100% isodose line between March and May of 2009, and was delivered using Novalis Tx (BrainLab, Westchester, Illinois) (Figure 2). Gross tumor volume (GTV) was defined as the index lesion as identified on CT/MRI fusion imaging. Planning target volume (PTV) was defined as an isovolumetric expansion of 7 mm on the GTV. The patient completed treatment with only grade 1 toxicities, including alopecia, fatigue and nausea. The patient was seen for follow-up in November 2009, 6 months after completing therapy. At that time, her tinnitus improved without any radiographic changes. She did not report any grade 2 or higher toxicity. The patient was evaluated annually for follow-up until November 2013 when that changed to biennially, with her last follow-up in November 2015, 6 years after completing therapy. Throughout this period, the index lesion exhibited partial radiographic response per 2009 RECIST (Response Evaluation Criteria in Solid Tumors) criteria, with significant improvement in the cranial-caudal axis (Figure 1B). Clinically, left-sided hearing loss progressively improved over the 6 years of follow-up. Paragangliomas are rare, benign neuroendocrine tumors arising from extra-adrenal autonomic paraganglia. Generally, parasympathetic paragangliomas are found in the neck and skull base and are nonsecretory. They are commonly found along cranial nerve IX and X, the middle ear, the jugular vein, and the carotid bodies. 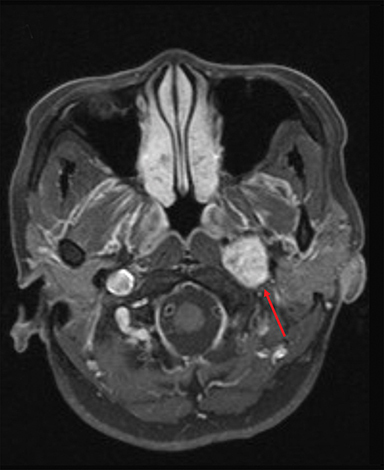 The natural growth of paragangliomas has been reported to be 0.8 mm per year with a doubling time of 14 years.1 Although these tumors have an indolent course, paragangliomas can be locally invasive and cause mass effect on nearby neck structures, especially the cranial nerves, which can present as dysphagia, hoarseness, pulsatile tinnitus, and hearing loss. Larger lesions can be palpated as a rubbery, nontender mass in the lateral neck and may cause a bruit if there is mass effect on the carotid vessels. Jugulotympanic lesions can result in a bluish pulsating mass behind the tympanic membrane. A variety of other pathologies can be considered with presentation of a head and neck mass: aneurysms of the carotid artery, lymphadenopathy, head and neck malignancies, branchial cleft cysts, meningiomas, schwannomas, and thyroid nodules. Diagnosis typically consists of biochemical and/or imaging modalities. Characteristic findings on computed tomography imaging include homogeneous mass with intense contrast enhancement. Characteristic findings on MRI include intense hypervascular appearance and classic “salt and pepper” representing hemorrhage and flow voids, respectively, on T2-weighted sequences. Somatostatin receptor scintigraphy utilizes indium-111 labeled pentetreotide, a somatostatin analog, which binds avidly in neuroendocrine tumors and can be detected with single-photon emission computed tomography imaging. Although tissue diagnosis is definitive, many of these lesions are not biopsied prior to resection either due to large size or active secretion. Thus, somatostatin scintigraphy can be used to localize and differentiate neuroendocrine tumors from other more common head and neck malignancies. The treatment goal for a paraganglioma consists of achieving cure as defined by durable radiographic or clinical stability with avoidance of critical neurovascular structures and absence of local disease progression. Management options include observation, surgery or radiation therapy. Overall, radiation therapy and SRS provide equivalent local control compared to surgery, with the benefit of decreased morbidity.4,6 Selection of treatment options is often based on institutional bias and clinical preference. Nonsurgical candidates or those with high potential for neurovascular morbidity may benefit from radiation therapy, typically IMRT. SRS is usually reserved for smaller lesions (< 3 cm) given the risk of a marginal miss or for those who cannot tolerate a fractionated course. Although a randomized controlled trial would allow for an objective comparison of surgery vs. radiation therapy/SRS as primary treatment, this is unlikely given the low incidence of this condition and strong opinions regarding best management. A 56-year-old woman presented with a 1-year history of hearing loss/tinnitus, intermittent dizziness and hoarseness. MRI of the brain revealed a 2.2 × 1.8 × 6.0-cm heterogeneous mass in the infratemporal region below the skull base within the jugular foramen. 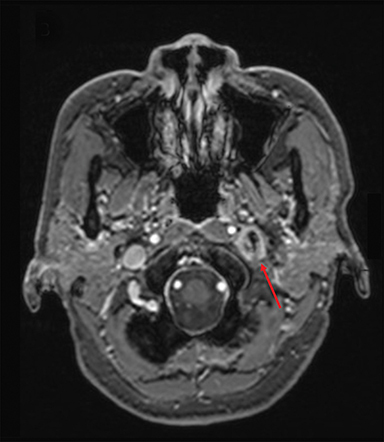 With positive uptake on somatostatin receptor scintigraphy, the presumed diagnosis was a paraganglioma of the skull base. She was treated with IMRT to 4500 cGy in 25 fractions using 6 MV photons. The patient reported only grade 1 side effects at the end of therapy. She was last seen at a 6-year follow-up when she was nearly asymptomatic, and a previous MRI at a 4-year follow-up, which showed a progressively smaller 1.3 × 2.0 × 3.0-cm mass. Historically, surgery was the gold standard in definitive treatment for skull base/neck paragangliomas. Although cure rates were excellent, there was a significant rate of cranial nerve morbidity, especially with skull base/neck structures. Here we report a case of a skull base/neck paraganglioma that was treated with IMRT and achieved local control with 6 years of follow-up. Jansen JC, van den Berg R, Kuiper A, et al. Estimation of growth rate in patients with head and neck paragangliomas influences the treatment proposal. Cancer. 2000;88(12):2811-2816. Gottfried ON, Liu JK, Couldwell WT. Comparison of radiosurgery and conventional surgery for the treatment of glomus jugulare tumors. Neurosurg focus. 2004;17(2):E4. Hinerman RW, Amdur RJ, Morris CG, et al. Definitive radiotherapy in the management of paragangliomas arising in the head and neck: a 35-year experience. Head Neck. 2008;30(11):1431-1438. Ivan ME, Sughrue ME, Clark AJ, et al. A meta-analysis of tumor control rates and treatment-related morbidity for patients with glomus jugulare tumors. J Neurosurg. 2011;114(5):1299-1305. Gilbo P, Morris CG, Amdur RJ, et al. Radiotherapy for benign head and neck paragangliomas: a 45-year experience. Cancer. 2014;120(23):3738-3743. Combs SE, Salehi-Allameh B, Habermehl D, et al. 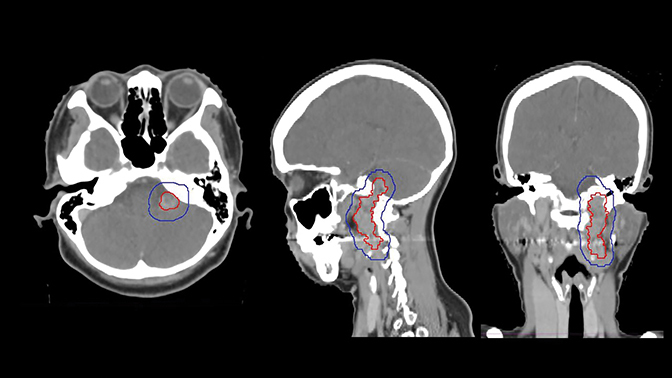 Clinical response and tumor control based on long-term follow-up and patient-reported outcomes in patients with chemodectomas of the skull base and head and neck region treated with highly conformal radiation therapy. Head Neck. 2014;36(1):22-27. Guss ZD, Batra S, Limb CJ, et al. Radiosurgery of glomus jugulare tumors: a meta-analysis. Internat J Radiat Oncol Biol Phys. 2011;81(4):e497-502. Ma Z, Parsai S, Gandhidasan S, Suh JH. 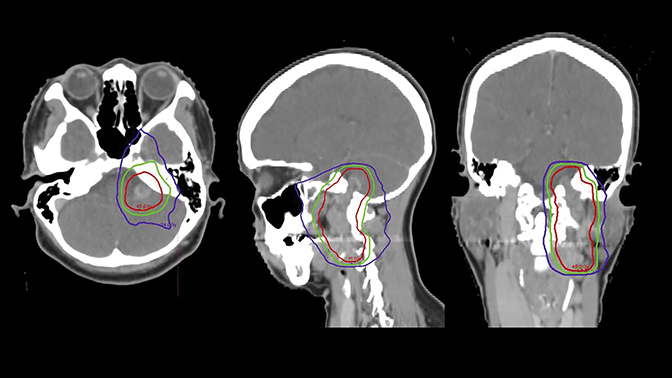 Paraganglioma of the skull base treated with intensity-modulated radiation therapy. Appl Rad Oncol. 6(1):30-32. Mr. Ma is a fourth-year medical student, University of Central Florida College of Medicine, Orlando, FL; Dr. Parsai is a resident physician, Dr. Gandhidasan is a fellow, and Dr. Suh is chairman, Department of Radiation Oncology, Taussig Cancer Institute, Cleveland Clinic, Cleveland, OH. Conflicts of interest: Dr. Suh: consultant for Varian Medical Systems, Palo Alto, CA; speaker for Philips Medical Systems, Amsterdam, The Netherlands; travel and lodging by Elekta, Stockholm, Sweden.